Rolf Losansky is a German film director and screenwriter and ranks among the most successful directors of children´s films at the DEFA film studios in Potsdam Babelsberg. Born on the 18th of February 1931 in Frankfurt Oder, son of the sign-painter Alfred Losansky and his wife Luise, a nurse. After his education as a printer between 1946-49, in Frankfurt Oder and Krumbach (Schwaben), he continued his education in Berlin from 1950-53. Initlally, for the first three semesters, Rolf Losansky studied medicine at the Humboldt University, Berlin. He then changed his plans and decided to study film at the Deutsche Hochschule für Filmkunst in Potsdam-Babelsberg choosing to become a director. The directors Martin Hellberg, Richard Groschopp, Kurt Maetzig and Andrew Thorndike were his teachers. 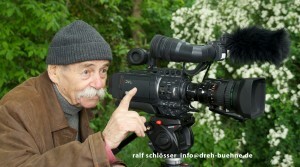 Already during his studies, he supported Wera and Claus Küchenmeister by selecting children for their documentary film „Dream for Tomorrow“ (1956). He helped Annelie and Andrew Thorndike research archives for their documentary film „Operation Teutonic Sword“ (1958) and assisted the director Joachim Hadaschik and Ivo Toman (Czechoslovakia) with their documentary film about the first Summer Sports Festival (Sommerspartakiade) in Leipzig. His documentary film „Soldier and Sportsman“ (1959) was his final college film. With this film Rolf Losansky earned his diploma in 1960 alongside his theoretical work. He is the father of two children and lives in Potsdam. We thank Rolf Losansky for over 20 films, the major part being films for children and young people. In all his children´s films, the director uses humor, ease and plenty of fantasy to take on the problems of children. Hereby he shows his great educational as well as artistic empathy. The exceptional charm of his films is supplimented with the application of animation techniques which bring to life the fantastic elements and integrate them into the story to make them appear believable. With the educational media project „Who will kiss Sleeping Beauty? ?“, in the small town of Erkner, the director used simple yet professional methods to bring an understanding of film production to the children, youth and adults. He showed them how the professionals work, what it means to be an actor/actress, or a camera operator and how important the sound operators and make up artists are in a film. On September 15, 2016 Rolf Losansky died at the age of 85 years.